With the country’s inflation rate at a nine-year high, money-savvy individuals are looking into other methods of investing their capital beyond the traditional pooled funds or bonds, where interest rates are often too low to cope with rising consumer prices. One of these alternative methods is stock trading, or the constant buying and selling of stocks throughout the day and earning through the frequent changes in their prices. Almost the complete opposite of stock investing—holding onto stocks and letting their value appreciate over time—stock trading has become a relatively popular strategy among several groups of Filipinos. Among the largest groups of stock traders today is Investagrams, a fintech startup that has helped over 270,000 users with its stock trading tools, tutorials and social platform. The company is holding an event on Saturday, December 8, at the SM Aura Premier to bring these features to more stock market enthusiasts. 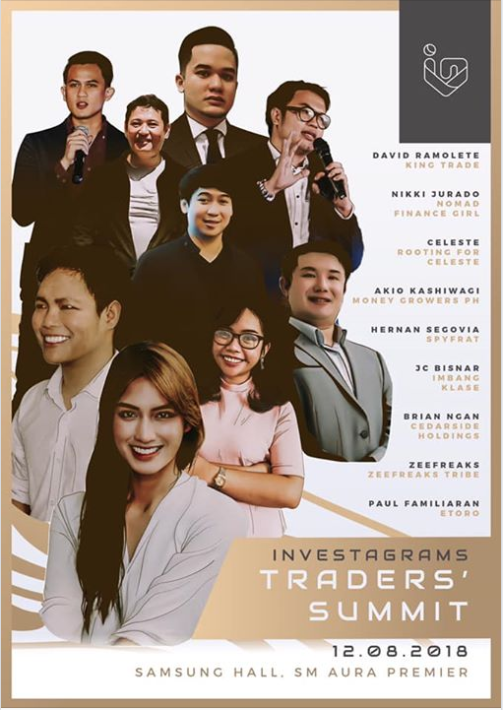 The Investagrams Traders’ Summit 2018 will feature talks, sessions and panels with prominent traders and industry experts who will share their experiences and strategies on stock trading. These include ZeeFreaks, the head of trading community ZF Tribe, and Akio, founder of YouTube channel Money Growers PH. “The summit brings together local and global traders and investment professionals to unravel the right tools to a successful trading journey through speakers' talks, a panel discussion, interactive event setups and valuable networking opportunities—all in just one day,” said Investagrams. Among the topics that will be covered are managing risks when trading stocks, diversifying portfolios and comparing technical and fundamental approaches to the stock market. For JC Bisnar, the CEO and co-founder of Investagrams, these in-depth topics are perfect for any stock market enthusiast who wants to take their trading a step further. “As you trade the higher levels, you have to use higher level strategies,” he said. For a full list of speakers and their respective topics, as well as for details on how to avail of tickets, click here.